Elizabeth’s one serious rival for the English throne was her cousin, Mary Stuart, queen of Scotland. In 1559, Mary, then only 16 years old, had been married to Francis II, the king of France. When Francis died in 1560, Mary returned to Scotland. Mary was Catholic, but the situation in Scotland when she returned did not favor the Catholic Faith. The year before her return, John Knox, a follower of John Calvin, had convinced the Scottish parliament to abolish the Mass and organize the Scottish Church according to Calvinist beliefs. This, the Presbyterian Church, became the state or established church of Scotland, as the Church of England (also called the Anglican Church) had become the established church of England. Needing support to keep her throne, Mary married Henry Stuart, Lord Darnley. But Darnley demanded from Mary the powers of a king – something he did not have simply by being married to her. 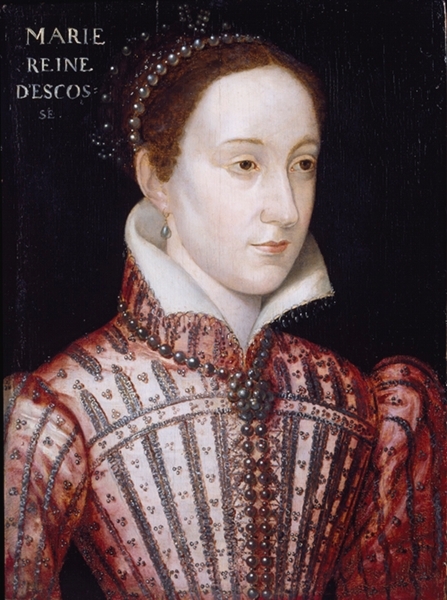 In 1567, Darnley was murdered; shortly afterward, Mary married the man who was accused of murdering him. This marriage angered her chief supporters as well as the Presbyterian clergy of Scotland. Her life was threatened in Scotland, so Mary fled to England and sought protection from Elizabeth. Mary left behind the son she had with Darnley – James, who was raised a Protestant. He became King James V of Scotland. Instead of protecting Mary when she arrived in England, Elizabeth had her arrested in 1568. Mary remained under house arrest in England for the next 19 years. Philip II* was determined to rescue Mary Stuart if he could, and Elizabeth’s fears of a Spanish invasion may have decided Mary’s fate. Mary was condemned to be executed as a traitor to the English crown. Throughout the night before her execution, with the hammering on the scaffold in the background, Mary prayed, “Even as Thy arms, O Jesus, were spread here upon the cross, so receive me into Thine arms of mercy, and forgive me all my sins.” She went to the place of execution carrying a crucifix and a prayer book. She was executed by beheading on February 8, 1587. She was 44 years old. *Philip II was king of Spain and the husband of the late Queen Mary of England, Queen Elizabeth’s half sister and the daughter of Henry VIII’s first wife, Catherine of Aragon. Mary had restored England to the Catholic Church during her reign, but Elizabeth returned the English Church to schism and Protestantism. Thomas Tallis is known as one of England’s greatest composers. He composed liturgical music for King Henry VIII; Henry’ son, Edward VI; Henry’s daughter (by Catherine of Aragon), Queen Mary; and Elizabeth I, Henry’s daughter by Anne Boleyn. Tallis died in 1585, two years before the execution of Mary, Queen of Scots. This is a recording of a portion of Tallis’ beautiful Lamentations of Jeremiah. Despite Henry’s schism, and the Protestant establishment under Edward VI and Elizabeth, Tallis remained Catholic until his death.